Famous mostly for its sea and coastline, Sardinia also abounds in spectacular natural scenery and numerous archaeological ruins, such as the archaeological sites of the early Prehistoric times and the nuragic villages, should not be ignored, as they represent the importance of the geographical and strategic position of Sardinia in the Mediterranean. Sardinia has some of Italy’s best beaches and on this tour we make sure that you’ll have time to enjoy them. Sardinia is a world apart, an island separated from the rest of Italy not only by the sea but also by centuries of history and cultural experience. The light-reflecting granite rocks, the dense, dark forests, the sandy coves, the expansive panoramas of Cap Corse or the compressed Bozio valley- Corsica is an enigmatic island with many and varied faces. Despite its large number of visitors, the island remains a wild and fascinating place. 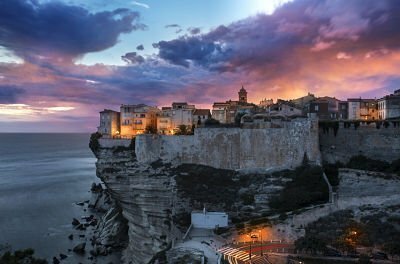 With their mild climate, clear sea, impressive cliffs and the bright colours of the Mediterranean shrubs, Sardinia and Corsica are a true paradise and an ideal destination. 12 DAYS SARDINIA & CORSICA SMALL GROUP TOUR :"SARDINIA & CORSICA LEGENDARY ISLANDS "
Dear Aldo, Please know that my recent tour of Sicily with Rosaria was wonderful!! !She was such a lovely person to deal with and took very good care of us all. She was quite knowledgeable about the country and all the beautiful sights we saw.I am telling all my friends here in the US about your tour company and would hope I can return to Italy myself one day soon and I would gladly use your tour company! Being of Italian decent ( Naples) I enjoyed all the food and wines of Sicily and was amazed how beautiful it was. Please send my regards to her and thank you for all your work planning and setting up this tour.The hotels were perfect and the service was outstanding.Best wishes for continued success with Secret Tours. Another great tour from Secret Italia – excellent guide (Cynthia) fine hotels, outstanding restaurants. We love the way you include many local experiences to give us a feel of Malta and its vast history. We continue to tell our friends of your outstanding tours. We look forward to another one in the future. Harold and Betsy. Our tour of Puglia and Basilicata was perfect. The itinerary, accommodation and transport were excellent. The included meals were great but as always on Secret Italia tours we ate too much! Even the weather was perfect with warm sunshine every day. Then there was our guide, Paola. We knew from the first friendly greeting we had a treasure here. She shared her considerable knowledge with enthusiasm and ensured our tour ran smoothly. Her warmth and humour were contagious and by the end of our tour she had become not just a wonderful guide but a real friend. We have recommended Secret Italia Tours many times and will continue to do so. Our extension to Altomonte in Calabria was a delightful surprise. The little hill town is set in beautiful country close to the Pollino National Park. Our three night stay in the family run Hotel was faultless. Our room was large and comfortable with a view to the old town with its castle and cathedral. The family have a passion for local food and culture and a commitment to fresh local produce much of which comes from their own garden. With great food and excellent service the hotel is definitely a place we would recommend. The day trip to Albanian villages of the Pollino National Park also provided surprises. The scenery was spectacular and the villages fascinating. Bonnie Morosi and I traveled with your tour in May and it was wonderful! Your planning and choice of hotels and sites were memorable. The lunch with Rita and Suzanne was excellent and what lovely people. Christian, our driver, was so professional and a pleasure to be with as we drove from one destination to another. Our guides were knowledgeable and informative, and I streamed 245 pictures home with typed descriptions. Coming to Sicily connected me to my heritage and I felt as though I had visited family. Thank you for the pristine planning and for checking on every day to make sure we were happy. I will visit Sicily often. I am encouraging my friends to visit Sicily and use Secret Italia tours. It was a remarkable two weeks! Chuck and I cannot say enough good things about our trip! We absolutely loved it all…the itinerary, the places we stayed, the organization of your staff, and it’s planning and execution were phenomenal.We loved the enthusiasm of Rosaria, and felt we wanted to take her home with us!! She was energetic, informative, and was always aware of our needs. We loved her humour and she is definitely an asset to your company. Marco was an excellent driver–we always felt safe, especially maneuvering the narrow places and climbing the mountainous, winding roads. He always had a pleasant smile. We could tell that he and Rosaria truly like working together. They are a great team! !The fact you and Katrin sent Chuck a birthday card was so very special, and then, on his birthday, Rosaria had the restaurant staff bring him a small birthday cake, and Rosaria even gave him a bottle of olive oil! The group sang Happy birthday to him! How special!! !The tour guides in the specific towns were so knowledgeable–we felt we learned so much!! And each had a unique personality always with a touch of humour. We loved that!We were so impressed with your company that we are definitely considering another tour in 2019. Again, thanks for our introduction to Sicily!!! And the start of many other visits to my husband’s ancestral homeland.